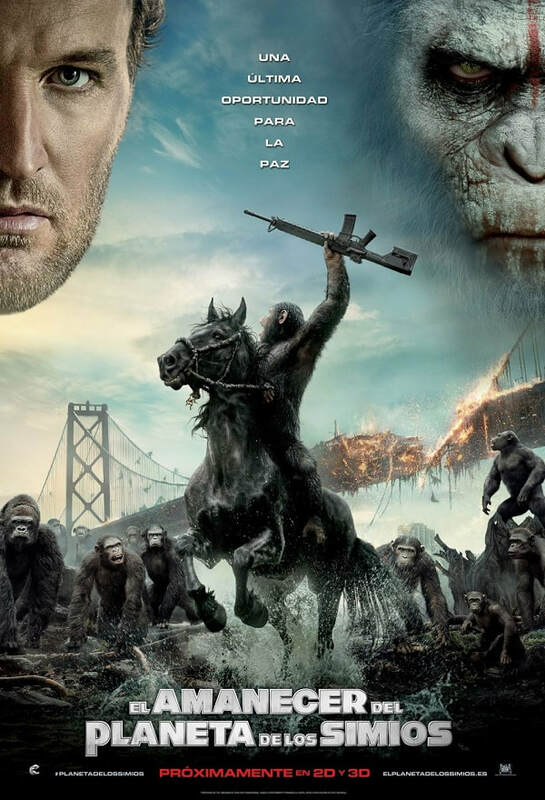 Dawn of the Planet of the Apes (2014) | Movie News & Review | - Pop Movee - It's about MOVIES! ​Physician: If you have a fever and cough or a sore throat, stay home. Male Reporter 1: The lab technician, now known as Patient Zero, was accidentally exposed to retrovirus ALZ-113, an Alzheimer's trial drug that was being testing on chimpanzees. Male Reporter 2: The infected chimps showed signs of erratic and aggressive behavior that led to their escape from the facility. ​Dreyfus: [addressing the crowd] We've been through hell together! We spent four years, FOUR YEARS fighting that virus, and then another four fighting each other! It was chaos... But you all know what we're up against. And I want you to know, it's not just about power. It's about giving us the hope to rebuild, to reclaim the world we lost! Caesar: War has... already begun. Ape started war. And human... Human will not forgive. You must go... before fighting begins. I am sorry... my friend. Malcolm: I thought we had a chance. ​Ten years after simian flu wiped out much of the world's homosapiens, genetically enhanced chimpanzee Caesar (Andy Serkis) and his ever-growing band of followers have established a thriving colony just outside San Francisco in Muir Woods. Meanwhile, a small band of human survivors emerges, which forces Caesar -- as leader -- to grapple with the dual challenge of protecting his people and re-establishing a relationship with the remaining human population -- the latter being Caesar's secret wish. An eerie silence fell over the cinema and the lights came up as the credits started to roll up the screen for DAWN OF THE PLANET OF THE APES. Audiences had been taken by surprise with Rupert Wyatt’s 2011 reimagining of the endearing science fiction saga from the late 1960s and first half of the 1970s. 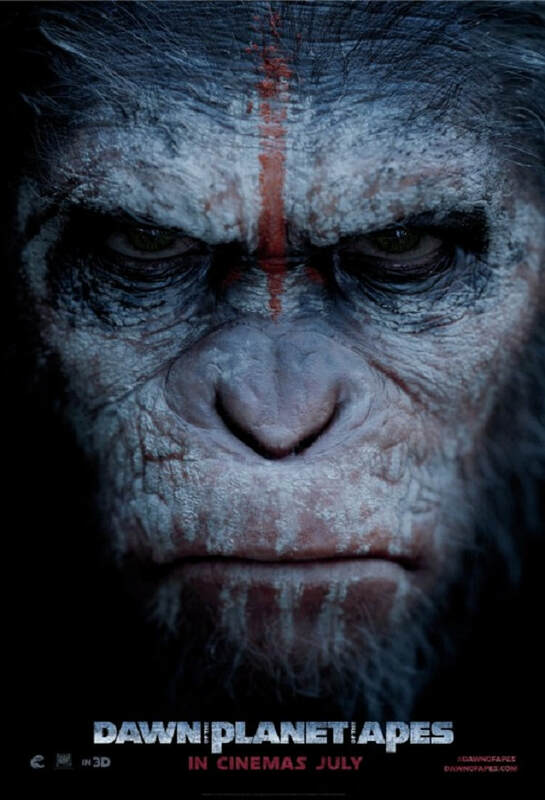 If you were “surprised” by RISE OF THE PLANET OF THE APES, then be prepared to be completely overwhelmed by this new movie. 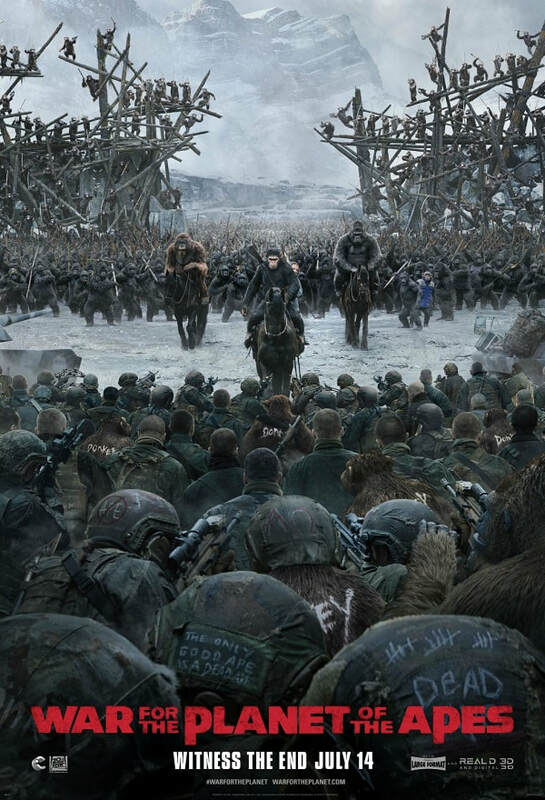 ‘Dawn of the Planet of the Apes’ can be summarised in two words: simply stunning! At its very best, cinema can completely and utterly immerse its audience in the power of story and the power of images. Under the direction of CLOVERFIELD director Matt Reeves, DAWN OF THE PLANET OF THE APES creates the most complete “world” since James Cameron transported audiences to Pandora in AVATAR. The preview audience at the screening of this new film didn’t know whether to clap in appreciation or shout out for the sheer imagination that they had just been unrolled before them. Judging by the number of people gathered in the foyer immediately after the screening, DAWN OF THE PLANET OF THE APES is a movie that is going to give moviegoers a lot to talk about. The film’s story, and resulting screenplay, is incredibly well structured. On one side, you have the escalating tension of the two main apes of 'Caesar', played by Andy Serkis, and 'Koba', played by Toby Kebbell. On the other, there’s 'Malcolm', played by Jason Clarke, and 'Dreyfus', played by Gary Oldman. The story cleverly transitions these four main characters throughout the course of the movie, with the humans starting off as the threat to the apes, but as events occur it becomes clear that the apes very quickly shake-off their noble savage idealism and take up arms against the threats posed to them. 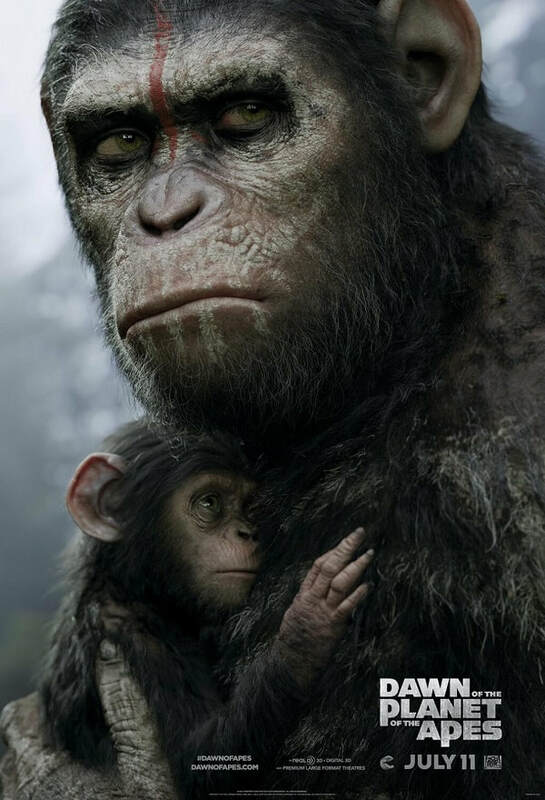 What makes the story even more compelling is that the apes descent into more sophisticated savagery comes after a great amount of time has been spent showing how much all the apes care for each other and the community they have built is truly representative of family. As their world becomes more and more compromised, the viewer appreciates the terrible sense of loss that is happening right before their eyes. Without elaborating too much, the film’s final act is superb. These days, many blockbusters don’t know when to quit. (IMichael Bay and his 165 minute running time…) DAWN OF THE PLANET OF THE APES clocks in at 130 minutes, but feels right. The action is well staged and though the great majority of it is 100% CGI, unlike many films over the last few years, the animation is seamless and is required to tell the story. 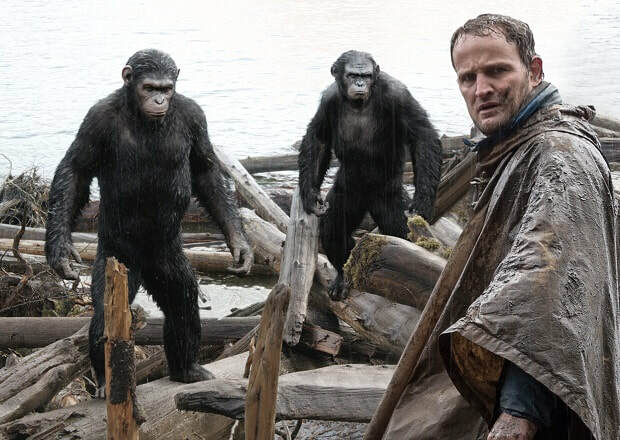 During the finale, the editing moves back and forth between the apes and the human part of the story that plays out between Clarke’s and Oldman’s characters; making it one of the better denouements at the movies this year. Moviegoers looking for their next ‘Transformers’ hit should steer well clear of this movie; however, if you like a touch of pathos in your endings, then DAWN OF THE PLANET OF THE APES could be what you’ve been hoping for. It’s easy to get swept up in the immediacy of the viewing, but this movie would have to stand as one of the great follow-up films of all time. It’s not a direct sequel, but the main ape characters from the first movie all appear. Ten years have passed since the events of RISE and the exposition to move the story to the time of DAWN is handled nicely in an opening credits prologue. What the screenplay and Reeves’ direction do really well is to reintroduce the apes and expand upon what the audience already knew about them at the conclusion of RISE. Dare it be said, but tonally there’s a little bit of THE EMPIRE STRIKES BACK and TERMINATOR 2: JUDGEMENT DAY about DAWN OF THE PLANET OF THE APES. Characters that the audience thought they knew are written and played differently this time and there’s a great balance between the intimate and the epic. 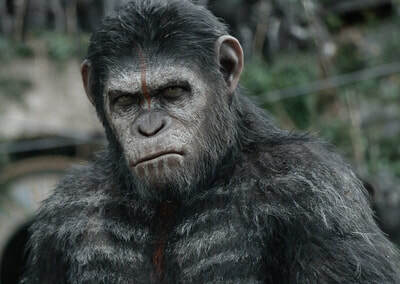 Central to the success of all this is Andy Serkis, who returns as ‘Caesar’, the ape whose intellect has benefited the most from the use of an experimental drug in the first film. Serkis is the pre-eminent motion capture actor working in films at the moment and his performance in DAWN is astounding. You may never see the real Serkis, but his vocal and physical work is outstanding and very seldom is there any consideration that ‘Caesar’ is an animated character. Even more astounding is how much of the dialogue between the ape characters is done in sign language. It’s a credit to not only Serkis, but to all of the actors portraying apes in DAWN, that so much emotion is conveyed in such a minimalist way. It’s incredibly effective and keeps the audience focussed on the actor’s performance. Special mention also goes to Toby Kebbell with his portrayal of ‘Koba’. His performance makes ‘Koba’ one of the truly great movie villains in recent memory; full of duplicity, anger and envy. One of the unfortunate parts of this movie is the brevity of the screen time for the human characters. 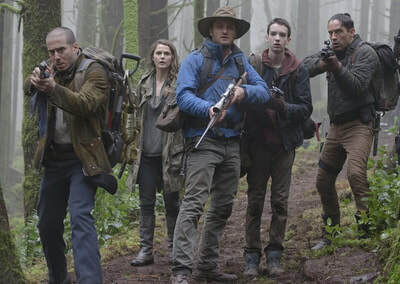 Jason Clarke shares a lot of scenes with the ape characters, but Keri Russell, Gary Oldman and Kodi Smit-McPhee all feel as though their characters could have far more screen time, but, then, the film would have run for 165 minutes… Other than Clarke, Smit-McPhee really shines as Clarke’s character’s son, 'Alexander'. His scenes with ‘Maurice’, played by Karin Konoval, are really touching as the two of them are among the first of the humans and apes to recognise what the other may have to offer. It’s hard to fault the technical execution of DAWN OF THE PLANET OF THE APES. From the top down, it’s a very assured film. Matt Reeves has not directed many movies but he has surely stamped himself as someone who can handle big budget fare such as DAWN. His previous two feature films were nowhere near as great in scope as this film, but it’s a great sign that directors with limited ‘blockbuster’ exposure like Reeves, Gareth Edwards, Josh Trank, Colin Trevorrow and Scott Derrickson are getting a shot at these larger films and making them both financially successful and creatively appealing. In addition to Reeves, credit must be given to Michael Seresin, the film’s cinematographer. Lighting and shooting a movie with such complex motion capture work must be incredibly difficult, but DAWN has its own visual style that makes it very different in its look to the previous film. Both the set and location photography for this film could not have been easy given it’s raining for the first two-thirds of the movie, but Seresin uses this to his advantage to create the visual metaphors that relate to the film’s title, with the dawn of the apes struggle and the regression of humanity into the darkness. 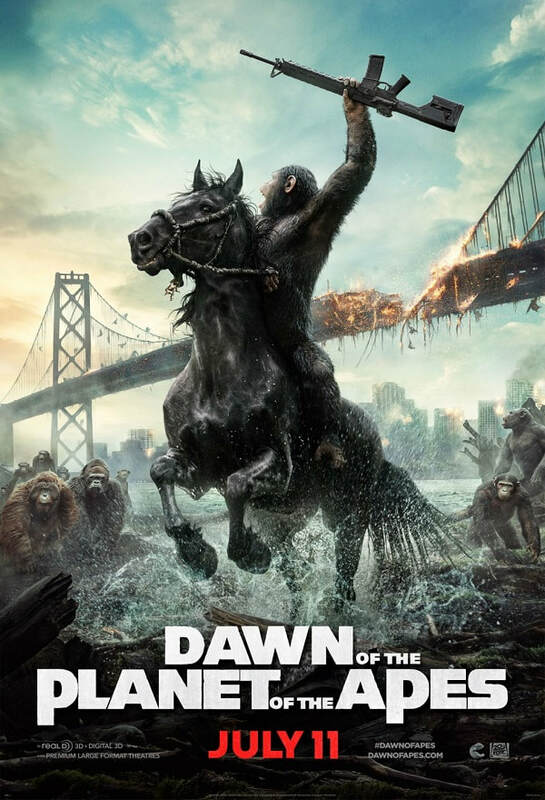 DAWN OF THE PLANET OF THE APES also gets the Michael Giacchino musical treatment. Once again, he demonstrates why he is the ‘Go To’ guy for movie music currently. Giacchino’s musical score mixes his own original pieces with cues from the original 1968 Jerry Goldsmith score for PLANET OF THE APES. It’s extremely clever and it adds an authenticity to DAWN that, for older fans of the franchise, feel as though they are viewing part of the ongoing saga that started 46 years ago! The fundamental question for is whether this film is good science fiction? The answer is a resounding YES. DAWN moves the story far enough forward in its timeframe that it becomes a commentary about the end of a dystopian society and the emergence of a new society that has to make a choice as to whether or not it itself becomes either dystopian or utopian. All sorts of moral, ethical, political and social dilemmas emerge and play-out as a result. It’s great science fiction. It’s riveting to watch and leaves the viewer much to contemplate even after the lights have come up on the final credits. A lot of thought has gone into making DAWN OF THE PLANET OF THE APES. This is clear from the story & its screenplay right the way through the production. It’s a real joy to watch a film that is so well crafted but also has all the hallmarks of being a smash hit blockbuster. Matt Reeves and screenwriters Rick Jaffa, Amanda Silver and Mark Bomback have given audiences a real treat and one that is neck and neck with X-MEN: DAYS OF FUTURE PAST as the best science fiction, fantasy or comic book genre entry so far in 2014. Make sure you see this film at the cinema and in 3-D.